With Over 25 ways to play, challenge Cozmo to games or use Explorer Mode to see things from his perspective! With a beginner-friendly interface, Cozmo is the perfect educational robot to learn to creatively code! Easier than you’d think and tougher than he looks, this toy robot is tested for durability and security! Cozmo by Anki requirements: a compatible iOS or Android device (not included) and the free Cozmo app! Cozmo is a real-life robot like you’ve only seen in the movies and he’s ready to be your loyal sidekick! 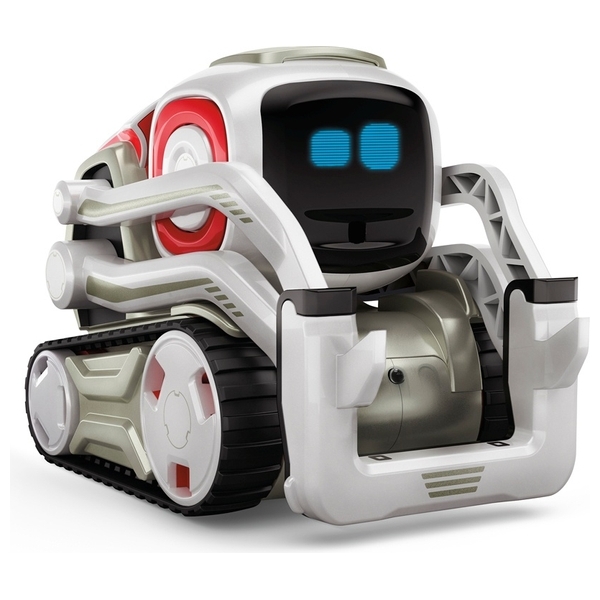 Cozmo by Anki is a clever little robot with a mind of his own. His unique personality evolves as you hang out with him, so there’s no end to the fun you can have together. Cozmo by Anki will nudge you to play and keep you constantly surprised. Play Quick Tap and Power Cube stacking games, unlocking even more games and upgrades as you play together. All of Cozmo’s functions have been condensed into simple drag and drop blocks that are easy to string together. This simplified programming makes coding Cozmo accessible enough for anyone to enjoy. Cozmo comes with his own charger and 3 Power Cubes. Accessing the high level robotics functions that bring Cozmo by Anki to life requires a free app and the processing power of your compatible mobie phone/tablet. You can check device compatibility at anki.com/devices. The Cozmo app is constantly being updated with new features to keep you entertained, so there are always new ways to play. App and device not included.